As you may know, I choose not to eat creatures with eyes. I encourage you to support the following appeal by Avaaz to protect the bluefin tuna. And I encourage you to consider reducing the amount of seafood that you eat. The world’s fisheries are in a devastated condition and, ultimately, our consumption patterns drive the systems which are severely damaging our oceans and their inhabitants. Do take the time to read the following information and click on the link to support Avaaz in their efforts to protect the world’s oceans. It is our collective voices which, when raised, will drown out the chatter of greed we are currently witnessing in the world. Bluefin tuna face annihilation. These majestic fish are at the heart of the marine food chain — without them, oceanic ecosystems could collapse. But a crucial summit launched today could be our chance at a vital recovery plan — with a global outcry. As the tuna talks begin, their outcome is utterly uncertain: Japan, which consumes 80% of bluefin tuna, is calling for action, but other nations are wary of its seriousness, and Europe is deeply divided and under pressure from Mediterranean governments allied with elite and even criminal fishing cartels. The situation is dramatic — Atlantic bluefin tuna have been reduced to just 15% of their historic levels and tuna fishing is becoming a business of criminals with a $4 billion black market. One tuna fetches $100,000 and fishermen are duping the regulators with falsified data, shunning monitoring systems, rampantly overfishing and selling illegal, unreported and unregulated fish. All those responsible for ensuring sustainable tuna stocks are failing — The International Commission for the Conservation of Atlantic Tunas (ICCAT), the global regulating body that meets this week, has ignored their own scientists recommendations for a blue fin fishing ban; the EC Fisheries Commissioner, who initially proposed emergency action, is being blocked by member states and the EC has itself subsidised specialised vessels for over exploitation; and trading countries have illegally exceeded ICCAT quotas. Continued negligence could wipe out blue fin tuna completely. Today, tuna profits are controlled by a very small high-tech fishing elite who run purse seine vessels and tuna fattening farms. But the rest of the fishing communities livelihoods are suffering massive losses. And this plundering affects all of us — as bluefin are near the top of the food-chain their commercial extinction could set off a domino effect with dire consequences. Put simply — without the big predator fish, the medium fish will eat all the small fish and no one is left to eat the microrganisms. In just a few decades this could mean our oceans die and are overrun by jelly fish and slime. Ironically it may be Japan who push hardest for serious action at the ICCAT meeting. 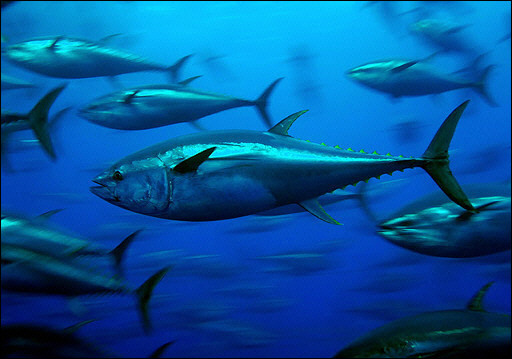 The Japanese Fisheries Agency is saying Japanese consumers may have to “just forget about tuna for the time being,” whilst the Mitsubishi Corporation, one of the world’s largest buyers of bluefin tuna has announced its commitment to protect healthy stocks, support spawning sanctuaries and reduced purchases to enable the recovery of threatened populations. These magnificent species have been exploited to the brink of collapse — and this summit could be our last chance to save them or they will disappear from our oceans forever.